“On the Road Again,” “Angel Flying to Close to the Ground;” roles in Barbarosa and Red-Headed Stranger; co-founding Farm Aid. "A lot of country music is sad. I think most art comes out of poverty and hard times. It applies to music. Three chords and the truth - that's what a country song is." He’s recorded 250 albums, written 2,500 songs, and for half a century played countless concerts across America and around the world. He’s been instrumental in shaping both country and pop music, yet his appeal crosses all social and economic lines. Sometimes he’s called an outlaw, though from Farm Aid to the aftermath of September 11, from the resurrection of a burned-out courthouse in his own hometown to fanning the flame of the Olympics, it is Willie Nelson who brings us together. At age 69, the red-headed kid from the Lone Star State still sings strong and clear. 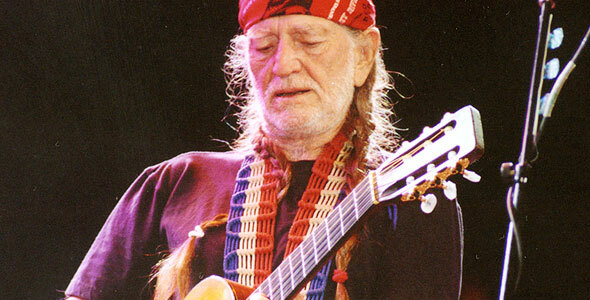 Born in Abbott, Texas, in 1933, Willie Hugh Nelson was raised by grandparents with a keen appreciation for music. 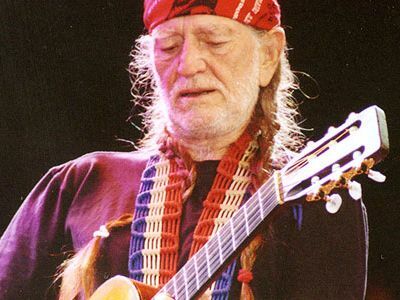 By age seven, Willie was already writing songs, playing them on guitar with his sister Bobbie on piano, and picking up musical influences from the gospel and devotional music of Texas churches to the blues and Latino songs he heard from fellow workers in the fields. Graduating from talent shows and local bands, he moved to Fort Worth where he perfected his chops with a double shift — country music DJ by day, honkytonk singer by night. Forming his own band, Willie had a string of minor hits that stretched throughout the sixties. But Nashville wasn’t ready for the jazzy phrasing and nasal tones of his straight-from-the heart singing style, so Willie packed up and came home to Texas. Moving to Austin in 1972, he somehow managed to unite crew-cut rednecks with long-haired hippies in a common appreciation of his blend of country, rock, folk and jazz. It all came together like yesterday’s wine with the 1975 release of RED HEADED STRANGER, a concept album which told the story of an Old West preacher and his fall from grace. On that album was Willie’s version of Roy Acuff’s “Blue Eyes Crying in the Rain.” The rest was history. Defying the restrictive confines of Nashville music, Willie and his pal Waylon Jennings became the leaders of a group of renegade musicians known as The Outlaws. Anthems like “Mammas Don’t Let Your Babies Grow Up to Be Cowboys” and “Luchenbach, Texas” brought a huge audience to their music. Always eager to do more, Willie teamed with producer Booker T. Jones and released a collection of pop standards entitled “Stardust,” which went straight up the charts, eventually selling over four million copies. Acting roles followed in 1979 with a small part in Robert Redford’s THE ELECTRIC HORSEMAN, followed by the starring role in “Honeysuckle Rose,” which also featured a new Willie ditty called “On the Road Again.” Starring roles followed in BARBAROSA, RED-HEADED STRANGER, SONGWRITER and a dozen more. Throughout the 1980s, the hits also kept coming, many of them in a long string of memorable duets –“Pancho and Lefty” with Merle Haggard and “To All the Girls I’ve Loved Before” with Latin pop star Julio Iglesias. Teaming with old pals Johnny Cash, Waylon Jennings and Kris Kristofferson to form the Highwaymen, Willie charted three more albums and continued to burn up the highways of America. In 1985, he was a co-founder of Farm Aid, a string of annual concerts to benefit America’s family farmers. His name was kept even more in the headlines, though, by his battles with the IRS, who declared his finances a mess and handed him a bill for $16.7 million in back taxes. Unfazed, Willie toured virtually non-stop and dedicated the profits of a new double CD entitled WHO’LL BUY MY MEMORIES? By 1993, the Feds had been paid in full. In the past decade, his star has only risen higher. High profile albums like Across the Borderline, Spirit, Teatro and The Great Divide have been sandwiched between numerous smaller releases– like Milk Cow Blues and an endearing kids’ album entitled, The Rainbow Connection. Through it all, Willie’s business and creative philosophy has been almost the opposite of the rest of the record industry. Conventional wisdom says to dole out your songs in doses, record one album every couple of years, and not get overexposed. By contrast, Willie’s almost-lifelong philosophy has been to record as much and as often as he has songs, and to play as many concerts a year as he can get to. Today, the crowd at a Willie concert generally encompasses several generations of music fans, from youngsters to great-grandparents, with a healthy dose of that all-important record-buying crowd in their teens and twenties. Kicking off with “Whiskey River,” Willie sails through twenty hits in a little over an hour. At the point most performers would be calling it a night, Willie generally switches from “Trigger” — his well-worn Martin acoustic guitar — to a black Fender Stratocaster. The crowd goes wild as he smokes through a bluesey “Nightlife” and the sublime “Angel Flying to Close to the Ground.” One type of music slides into another, the A-plus catalog of American musical styles with hints of swing, jazz, big band, and rhythm and blues. In his unique singing style, Willie’s voice is constantly phrasing behind the beat as he trades licks with his band of thirty years. After the encores, interviews and autographs, it’s the wee hours of the morning as the bus pulls out for another city several hundred miles down the road, or maybe for a stop in Austin at Willie’s home, an 800-acre complex comprised of golf course, recording studio, cypress log cabin and his very own western-movie town called Luck, Texas. Tireless at play as he is at work, when he’s at home Willie’s likely to record a few tracks and play anywhere from 18 – 54 holes of golf a day. Besides, whenever he sits down, some fool will ask if he’s ever going to retire.